This studio is situated on the ground floor of one of Nelson’s finest heritage villas. It is spacious, colourful and light. With its wooden floors, oriental rug and tasteful furnishings, you will find this studio an attractive place to stay. 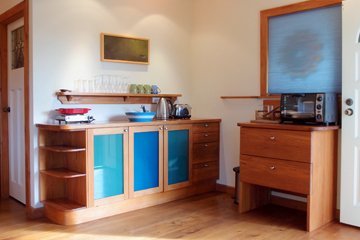 The kitchenette is made of recycled native timbers and coloured glass panels. It has all the essentials, including a small electric oven and wok. The stained glass windows give extensive views over the gardens and are situated on the north, which guarantees a lot of natural light. 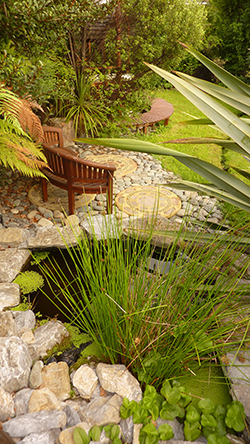 The separate lounge area opens to a sheltered, private terrace, overlooking the fruit and herb gardens and various water features. This studio sleeps 2 people in a king bed. The studio has all the facilities you’d need to be comfortable all year round. No immediate need for a car also, all shops and restaurants are relatively close by. Rates $ 185-230 – booking directly through this site rather than through one of our corporate affiliations is appreciated.